1 of 2 Combine flour, butter, sugar and salt in a food processor; pulse until mixture resembles coarse crumbs (butter will be the size of peas). Add 3 tbsp ice water and process until just combined. Pour onto a clean counter and form into a disk. Wrap in plastic and refrigerate 1 hour. 2 of 2 Heat oven to 375 degrees . Roll dough into a 10 1/2-inch circle on a floured surface. Fit into a 9-inch tart pan with a removable bottom, trimming edge. Refrigerate while making filling. 1 of 2 In a food processor, combine butter, 1/2 cup of the sugar and salt. Process until smooth. Add almond flour, eggs, all-purpose flour and almond extract. Process until smooth. 2 of 2 Toss raspberries with remaining 1 tbsp sugar and the lemon zest. Scatter half the berries in bottom of tart shell. Spread almond mixture (frangipane) evenly over top. 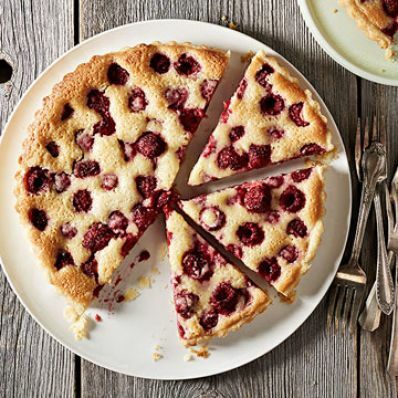 Scatter remaining berries over frangipane. Bake at 375 degrees for 45 minutes, until lightly browned. Cool on a wire rack. Per Serving: 250 kcal cal., 17 g Fat, total, 50 mg chol., 90 mg sodium, 8 g sat. fat, 23 g carb., 3 g fiber, 4 g pro.